If it’s true that behind every good man there is a good woman, then it’s worth considering a parallel inspiration, that behind many a good woman-to-woman friendship there exists a good man-to-man friendship—even a 47-year-long one. Consider the case of Ed and Vic, and Carol and Faye. Morgenstern, who came to IIT from Long Island, N.Y., didn’t own a car, so he and a date tagged along with an older, wheels-privileged fraternity brother (Michael Wolf, IE ’62) for a night on the town with his date, Faye Katz. Shortly afterward, Morgenstern found himself asking the permission of his fraternity brother to instead date Katz. Coincidentally, Katz, and Morgenstern’s IIT roommate, Ed Kaplan, were already acquainted with each another as they attended Senn High School together along with a classmate by the name of Carol Kozin. “Since Carol was best of friends with Faye,” says Kaplan, “it didn’t take too long before the four of us were spending time together.” As the two men continued to develop their newly formed friendship—with Katz and Morgenstern becoming closer and Kozin and Kaplan becoming closer—the two couples also discovered the beginnings of a natural and shared camaraderie. Ed Kaplan and Carol Kozin married in January 1965; Vic Morgenstern and Faye Katz followed six months later, tying the knot on July 4. After attending Roosevelt University together and getting married, the two women continued to maintain a long-distance, telephone friendship, with the Kaplans residing in Illinois and the Morgensterns moving to Washington, D.C., where Vic attended law school at American University and worked initially for the United States Patent and Trademark Office and then for a legal firm. He knew by his junior year at IIT that his interests were diverging from chemical engineering to law. The senior partner of the law firm where Morgenstern was working encouraged him to take an interest in stock market investing; this led Morgenstern to a stock broker who introduced him to the then esoteric strategy of risk arbitrage investing. The broker sought Morgenstern’s advice on the legal implications of company mergers and influenced him to begin investing his own money. Eventually, the broker asked Morgenstern to join him in managing accounts. Thus began Morgenstern’s entry into the financial field, one that he ultimately made into a highly successful career. After managing money for a variety of clients in Washington, D.C., Morgenstern headed back to the Chicago area, spurred on by an offer to help Irving Harris, the cousin of one of his clients, conduct his family’s investment business. The decision to return to the Midwest was not difficult. After all, Morgenstern’s in-laws still lived on Chicago’s North Side and the Kaplans lived in Northbrook, where Ed was busy creating his own success story. “Vic was very, very active on campus. I had some positions within the fraternity, but I didn’t have any campus positions,” explains Kaplan, recalling how the traits and interests the roommates discovered and developed at IIT helped to guide them to their respective professions. “I studied hard at IIT; I wanted to do well. I was very intrigued with science and math.” His diligent studying earned him membership in the Tau Beta Pi engineering honor society and the Pi Tau Sigma international mechanical engineering honor society. He also received several National Science Foundation grants for his undergraduate research. Kaplan expected to pursue a graduate degree in servo-systems; however, at the last minute, he changed direction. He stayed in Chicago and went to work for the Seeburg Corporation. Shortly thereafter, he was awarded a three-year National Defense Education Act Fellowship to pursue a doctorate in business at Northwestern University. Once in the program, Kaplan decided he didn’t want to teach or hold a staff position in industry and instead went on for an M.B.A. at the University of Chicago Graduate School of Business, while working at the Teletype Corporation. He and Gerhard Cless, a Teletype colleague, shared ideas for their own company and left their positions to start what became known as Zebra Technologies, a manufacturer of on-demand labeling and ticketing systems, including thermal bar code label printers and supplies. As of December 2007, Zebra had sold more than 6 million printers to users in 100 countries and had net sales of a record $868.3 million. In addition to being a Zebra cofounder, Kaplan served as the company’s chair and CEO for 37 years before retiring in September 2007. Morgenstern continued to develop his financial acumen as a founding principal of the Chicago-based investment advisory firm Harris Associates, which he joined in 1969, the same year that Zebra Technologies’ predecessor company, Data Specialties, Inc., was incorporated. Morgenstern served as president and CEO of Harris from 1991–2000 and chairman from 1995 until his retirement from Harris in 2000. He also was president of The Oakmark Funds from its inception in 1991 until 2000 and chairman of its board of trustees until his retirement in 2003, at which time he went on to his current position as chair of Valor Equity Partners, a private equity firm running two funds in Chicago. Over the nearly 25 years between Kaplan’s and Morgenstern’s graduation from IIT and the establishment of their careers, their wives kept in touch even though their husbands were oftentimes too busy to do the same. “I would say that probably the biggest reason for us staying together was because of Faye and Carol,” says Kaplan. “Carol and I just had that special, special relationship,” explains Faye Morgenstern. 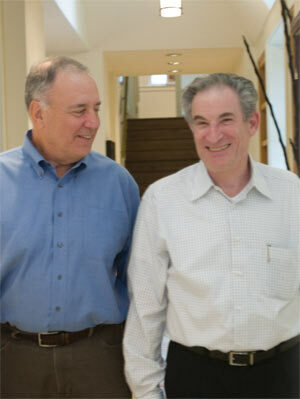 “It was a serendipitous friendship with the added coincidence that the significant men in our lives were fraternity brothers.” As their children grew up and their professional lives became more settled, the two men embarked on a new phase of their friendship, one that began with Kaplan’s invitation to Morgenstern to join the IIT Board of Trustees. “It was Ed’s suggestion to get me more involved with IIT that gave us more opportunities to interact,” says Morgenstern, who became a trustee in 1994 and also serves on the IIT Institute of Design Board of Overseers. In 2008, they both made the decision to expand their roles on the IIT board and become vice chairs and life trustees. The Morgensterns’ two architect daughters, Jennifer Morgenstern and Robyn Morgenstern Rosenblatt, are members of the IIT College of Architecture Board of Overseers; their son, Judd, is an IIT Institute of Design/IIT Stuart School of Business student. The Kaplans’ son Martin is CEO of Mesirow Advanced Strategies, Inc., and son Alan is president of Repak Real Estate Development Corporation.